Today was a much simpler day but filled with some incredible content. After getting our panel passes for Marvel’s Daredevil Netflix Exclusive Panel we spent the next few hours checking out the rest of NYCC. We explored the rest of the showroom floor which included Marvel, DC, and Lego. There were some incredible artists with great work on display. After that we grabbed a bite on our way to the Batman 75th Anniversary Celebration Panel. We were taken on a trip down memory lane as they explored the history of Batman. The panel consisted of many major Batman Comic creators from over the years. Jim Lee and Kevin Conroy were just two of the awesome panelists. They even talked about the Gotham TV series and how exciting its future is going to be. After the panel we explored what’s to come from Marvel Comics. Expect a new S.H.I.E.L.D. comic book based on the TV series. On display, they had some awesome artwork for the Star Wars comics and their spinoffs. They also offered a very brief explanation that all plots and worlds of Marvel Comics will meet up for Secret Wars. The next panel was a look at POWERS. A comic book that has been turned into a TV show exclusively for Playstation. Although I don’t have a Playstation, I was very intrigued by the concept of this show. Lead by Sharlto Copley, the show’s premise has him as a new detective to solving crimes. The catch? His specialty focuses on a group of people known as POWERS, who are for all intents and purposes, superheroes. These super-powered individuals are common and publicized widely. Shartlo was once one of these super-powered people but then had his power stripped away from him; now he just solves crimes. Ugh. Now I need to figure out how to watch this show without having a Playstation! 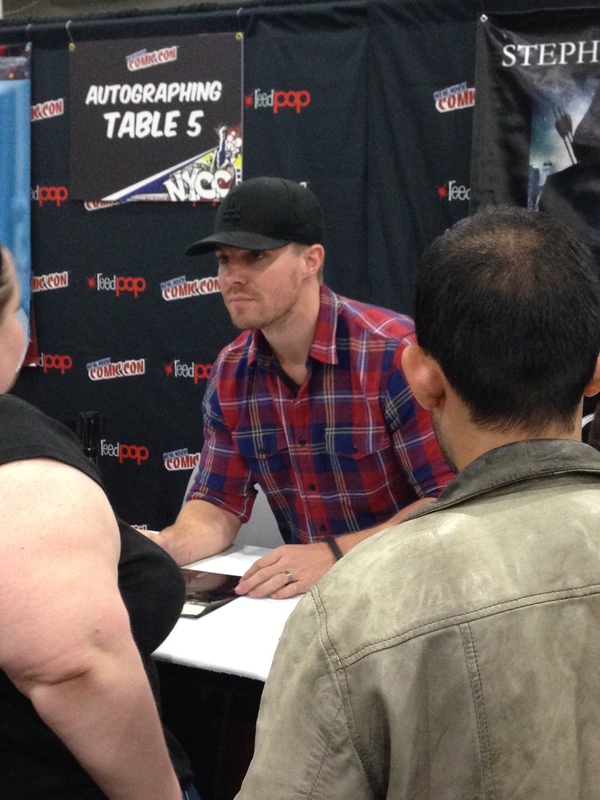 After that there was a Spotlight of Stephen Amell. He was alone on the panel and answered fan questions the entire time. SO AWESOME! He wouldn’t spoil anything about the show but he did mention that Hulk Hogan was his superhero influence when he was younger. He also talked about how difficult the death scenes are for him because he is so close to the actors. In a kind of spoiler he mentioned the story about him having a son will come up again on the show and also that the fact that all of these heroes and villains are popping up on Arrow and The Flash will be a heavy influence on Oliver’s personal journey throughout the season. I did have to leave the panel early to get to the Daredevil panel which was upsetting because Collin O’Donnell showed up as a surprise and I missed it. But it was well worth it. The Daredevil panel was awesome. We got to see multiple clips from the show. The entire cast showed up and we got to find out which actor was playing which character. The show will fit within the Marvel Cinematic Universe, which is a smart choice. It is one of five Marvel shows to be featured exclusively on Netflix. The other shows are Jessica Jones, Luke Cage, Iron Fist and the 4 will culminate in a Defenders series. This is big stuff! I will say Daredevil has a darker, grittier tone then I expected for Marvel right now, but I like it and that style suits the character really well. The awesome cast doesn’t hurt either!